Over the past decades body composition of broiler breeders has dramatically changed, influenced by market demands. Genetic selection on broilers resulted in a decrease in feed conversion, higher daily growth, less fat and more breast muscle. Wageningen UR Livestock Research in the Netherlands studied a higher reproduction in broiler breeders by providing less protein. "Developing fat is less efficient than developing meat, so body composition of broilers has changed to more meat and less fat. Also parent stock breeders have changed, influenced by these breeding goals of broilers," says Dr van Emous of Wageningen University in the Netherlands. As a result breeders also tend to deposit more breast muscle and less fat reserve. As these birds are bred for laying eggs, the combination of a lot of breast muscle and low fat reserves is unwanted from a reproductive perspective. One postulates certain amounts of body fat are necessary at the onset of lay in order to achieve maximal performance. Over the last decades fertility and hatchability declined. A few years ago Dr van Emous and his fellow researchers made an inventory of possible causes for this phenomena. "When fertility and hatchability dropped, we noticed many possible causes, including management, percentage of males, health and behaviour. Apart from these factors, we found in literature indications that a decreased fertility and hatchability could be connected to diet composition, in particular the daily protein intake during the laying period. Besides the decreased fertility and hatchability a substantial fall in production of parent stock at the end of the laying period occurred." Dr van Emous hypothesised this was related to an insufficient fat reserve at the end of rearing. He suspected there was a chance of improvement by changing the diet by lowering the protein intake during the rearing period. As the sector is relatively small, research funding is hard to find and little was known about how body composition affects reproduction of broiler breeders. Plus, because current body composition developed over five to six decades, it was uncertain whether this could be changed or not. Dr van Emous decided to investigate the effects of different feeding strategies on body composition during the rearing and laying period. The Dutch product boards and Aviagen asked the Wageningen University Livestock Research researchers to study the issue. "In early 2011 we started a large three year project, studying the effects of an adjusted energy protein ratio in feed during the different phases of the broiler breeder. In this project 2 different experiments were carried out. First a small scale experiment to find out if body composition could be affected by feeding strategies. 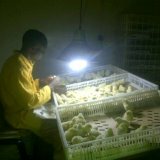 In mid 2012 we started a second experiment on a semi practical scale and birds were followed during the entire production cycle." A total of 2,880 Ross 308 female broiler breeder chickens were housed in 36 pens with 80 chickens per pen. The number of pullets per pen was reduced to 70 at 22 weeks of age due to mortality and selection. At that age, males from elsewhere were introduced to the pens. During the rearing period, 2 diets with different protein and amino acids levels were provided to the breeder pullets. Between 22 and 45 weeks of age, birds were fed three diets with different energy levels (3,000, 2,800 and 2,600 kcal/kg). From week 45 till week 60 the birds received two diets with different energy levels. The standard feed contained 2,800 kcal per kilogram, the high energy feed 3,000 kcal per kilogram (7% higher energy level). Protein and amino acid levels were equal for both feeds. "After 48 weeks the breeders fed the low protein diet during the rearing period produced more eggs, 3.5 hatching eggs more to be precise." This positive effect on production was caused by the increased fat reserves at the end of the rearing period. Birds were probably more able to mobilise energy reserves during the periods of a negative energy balance. For maintaining a growth pattern during rearing, broiler breeders had to provide a higher amount of feed with an increased energy to protein ratio compared to broiler pullets that were fed a diet with a standard energy to protein ratio. This resulted in an increased eating time and less stereotypic object pecking during rearing, which may indicate reduced hunger and frustration. On the other hand, a low daily protein intake during the rearing can lead to a poor feather cover. A 12% increase in daily feed intake, due to feeding low protein diets during rearing, resulted in a twofold eating time. Time budgets in behaviour showed that eating time was inversely related to time spent on stereotypic object pecking during rearing. A high-energy diet during the first phase of lay increased mortality due to ruptures of the tendons. This was probably caused by the lower feed intake during the initial laying period resulting in more activity and worse uniformity. Feeding birds the standard diets (as advised by the breeder company) produced more eggs than birds fed the high and low-energy diets. Feeding a high-energy diet during the second phase of lay lowered the protein intake with an average of 8.5% and the energy intake with 2%. As both feeds had equal levels of crude protein and amino acids the total intake was respectively 9.6 and 8.1% lower with the high energy feed than with the standard feed. Providing two different feeds with different energy levels turned out to have no effect on the production of the number of eggs. Yet, the breeders who were given the high energy diet produced eggs with a slightly lower egg weight, caused by the lower daily intake of amino acids and linoleic acid. A lower egg weight in the second phase of the laying period is positive as these eggs cost fewer nutrients. Breeders fed the high energy diet (and thus lower daily protein intake) showed an 1.5% higher hatchability, due to lower embryonic mortality in the hatching stage between 3 and 21 days of age. This effect was possibly caused by the lower intake of crude protein and amino acids by the chickens who were fed the high energy diet. "A possible cause could be the lower egg weight from birds fed the high energy diet". Besides this positive effect, high energy feed also decreased the number of second type chickens. Chickens who were fed the higher energy feed had a lower feed supply on average (9%), less feed intake time (16%) and higher speed of feed intake (9%). The latter suggests the animals were more eager to take in the feed. The day after Dr. Van Emous defended his thesis he flew to Indonesia, on invitation of Japfa Comfeed who wanted to know how to change their broiler breeders’ diet. "People from all over the world have contacted me ever since. Farmers have already experienced improvement by changing diets to higher energy and lower protein during the laying phase. The next step is to also change it during the rearing period. The profitability of the broiler breeder business is mainly dependent on the feed costs and the number of fertilised settable eggs and the number of day-old chicks," Van Emous emphasises. "Pullets fed the low compared to the high protein diet during the rearing period showed a 6% higher gross margin (€944 vs. € 891). This was caused by the increased hatchability (first phase of lay) and increased number of eggs (second phase of lay). For a standard flock of 21,000 females the annual increase in gross margin could be more than € 11,000." Feeding different energy to protein ratios during the first phase resulted in a negative gross margin. "Feeding birds the high energy diet during the second phase of the laying period resulted in a 3% higher gross margin (€ 937 vs. € 911). This was due to the lower feeding costs. Dr. Rick van Emous (left) during his thesis defence at Wageningen University. 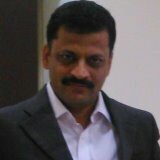 A good and interesting article with new finding worth emulating .in business enterprises. Tabular presentation with statistical approaches for inference could have been more useful. Similar studies on layers may prove to be helpful also. What should be the BEST criteria for feed increment during rearing of broiler breeders. What should be energy, protein levels in the feed. It is useful and informative article for broiler breeders. There is need to study in details the effects of different energy to protein ratio on egg size, production rate, hatchability and broiler efficiency particular between ages, 40-50 weeks, 50-60 weeks and 60-70 weeks.